Do you have your own brilliant ideas? Have you created a policy, procedure, or tool that makes records management work for your department? Let us know and we will share it on our Idea Board! Click here to view a handy flow chart you can use to sort through your files, papers, e-mails, and shared drives. 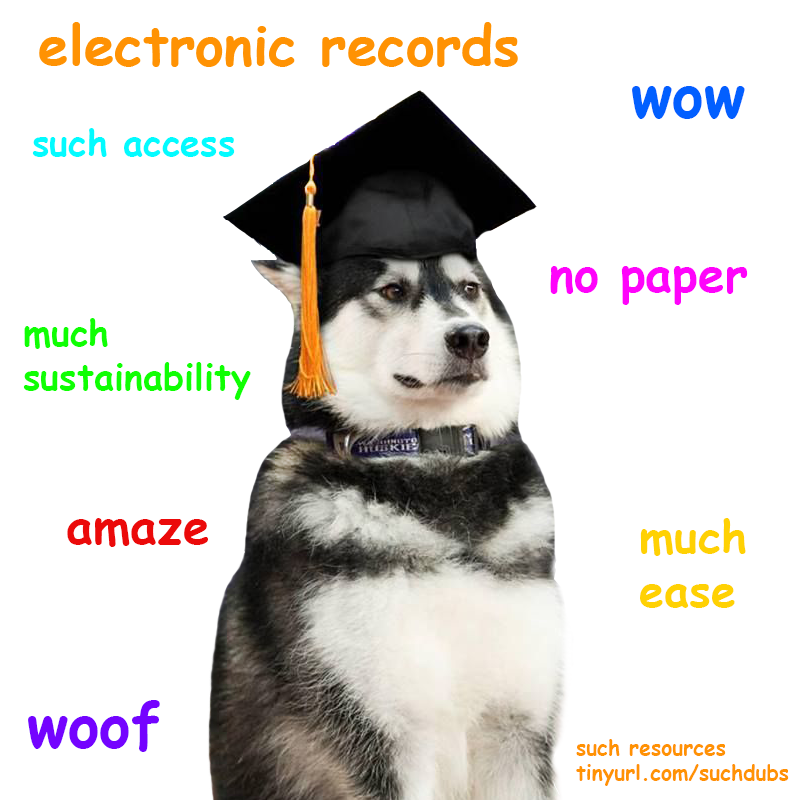 Click here to save and share our new electronic records management meme, featuring Dubs doing his best doge impression. wow! Visit our new Meme Library! Please feel free to use any of these memes in your office or department to promote good records management. Do you have one of your own? Send it over! Click here to view our infographic on managing your nebula drives, applying retention to your electronic records, and tips for naming and organizing your files. Be sure to download and print our poster version for your office! Records management can be a daunting task. The HR Records Management Group has found a way to make records management attainable and to establish a successful records management culture through all levels of the organization. The Group has been working since 2008 to improve records management practices within HR and consists of 10 individuals with diverse backgrounds and job responsibilities. During these five years, we’ve developed a formula that we will share with you in hopes that it will benefit you and your department. Watch the HR Webinar here: 30 minutes and worth it! The UW General Schedule -- Customized! Many departments find the General Records Retention Schedule to be overwhelming. A few departments have found a solution that works for them. They reviewed the General Schedule looking only for records that they create or receive—and they created a Records Retention Worksheet which is customized for their needs. Check out these great customized worksheets put together by the Bothell Libraries and the Humanities Shared Services Center You can use their worksheets or we are happy to help you create your own. It is important to check the UW General Schedule at least every 6 months to ensure that records retentions have not changed since the creation of your worksheet. Sean Kennedy in Finance & Adminstration came up with this handy flowchart to help organize his emails. Not only does it help with workflow, but has the added bonus of making email retention and deletion easier. Check it out and be inspired to make your own!